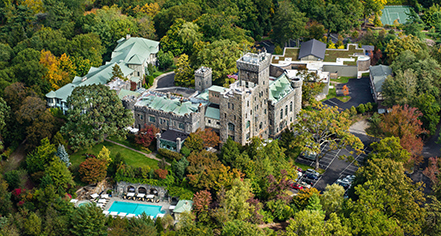 The Castle Hotel & Spa features a total of 31 luxurious accommodations, including six sumptuous and spacious suites with approximately 1,000 sq. ft. 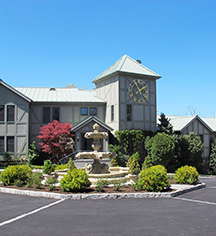 Guests of this extraordinary historic hotel can select from distinct experiences in either the original castle building or in Carrollcliff, the newest wing of the hotel. A variety of breathtaking views combined with exceptional amenities await to pamper Castle guests. Luxury Suites, located in the most historic areas of the original castle, are newly renovated, each uniquely designed with a living room and bedroom and furnished with a king-sized four-poster bed. Most suites feature wood burning fireplaces and are fitted with armoires. Guests enjoy breathtaking views of the Hudson River Valley and the New York City Skyline. The most luxurious imported linens and goose-down comforters are standard guest amenities. Truly a romantic retreat, the Castle Junior Suite also newly renovated boasts a resplendent king-size four-poster canopy bed, a private bath furnished with a free-standing shower and separate tub, a charming working wood fireplace, and an armoire with flat-screen HDTV. The Castle Junior Suite is also located in the oldest part of the hotel, offering expansive views of the Hudson River Valley and the vibrant Manhattan Skyline. The suite offers a large desk with a telephone and data processing line with complimentary high-speed internet access. Junior Suites provide opulent accommodations with a king-size four-poster bed and an alcove sitting area, including a private bath with a free-standing shower and tub. The Junior Suites feature a spacious and efficient desk with a telephone and data processing line, an armoire with a flat-screen HDTV, Bose sound system and complimentary high-speed internet access. The suites include the most luxurious imported linens, goose-down comforters and plush bathrobes. Junior Suites are nestled in Carrollcliff, the newest wing of the hotel. Junior Suites can be connected to adjacent Deluxe Guestrooms. Deluxe guestrooms are also located in Carrollcliffe, the newest wing of the Castle, offering one king-size bed or two queen-size beds and a private bath with a shower/tub combination. Deluxe Guestrooms can be connected to adjacent Junior Suites.